Dr. John Givogre was born and grew up in Michigan's Upper Peninsula. He was accepted into the University of Michigan's Integrated Premedical-Medical Program (Inteflex) after high school, and completed both his undergraduate and medical degrees at Michigan. He proceeded to do his internship at St. Joseph Mercy Hospital in Ann Arbor, Michigan and then moved to Baltimore, where he completed his residency in anesthesiology and accredited fellowship in pain medicine, both at the Johns Hopkins Hospital. 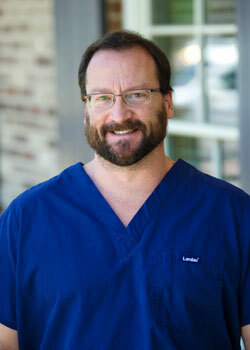 He then moved to Gainesville in 1994, where he has since practiced interventional pain treatment, treating thousands of patients. Dr. Givogre is board certified by the American Board of Anesthesiology in both anesthesiology and pain medicine, and also by the American Board of Pain Medicine.